Although holiday decorations and winter cold seem far removed from the affairs of summer harvest, in pre-industrial times life remained busy year-round as families needed to tend livestock and carry on other important chores. Considerable threshing of grain sheaves, for example, took place during winter as the brittle stalks that had been stored in barns since harvest were strewn about the covered threshing floor, or even on ice outside, to be struck with wooden flails in order to separate the golden kernels from the heads. To be sure, the winter time pace of labor was less intense than other seasons, and many agrarian traditions were associated with shortest days of the year. That the birds may come and eat. As children we were always presented with a sack containing peanuts and an orange after the annual church Christmas program in our hometown of Endicott—a tradition that continues to this day. Only later did I learn that in ancient times oranges commonly symbolized the sun while acorns and other nuts were also given during the week of the winter solstice (December 21) to celebrate the return of longer days and life’s renewal. Like families of many cultural backgrounds, ours has also long observed festive Christmas Eve dinners. A favorite entrée is the wide, paper thin Suesspleena egg batter pancakes and accompanying hot Schnitzel fruit soup of raisins, apples, peaches, and other flavorful “pieces” for which it is named, which is mixed with cream just before serving. When our beloved cousin Al first married into our clan many years ago, he led the procession around the holiday buffet and assumed the bowl of steaming brown was gravy, so proceeded to cover his mashed potatoes with it. We’ve never let him forget. 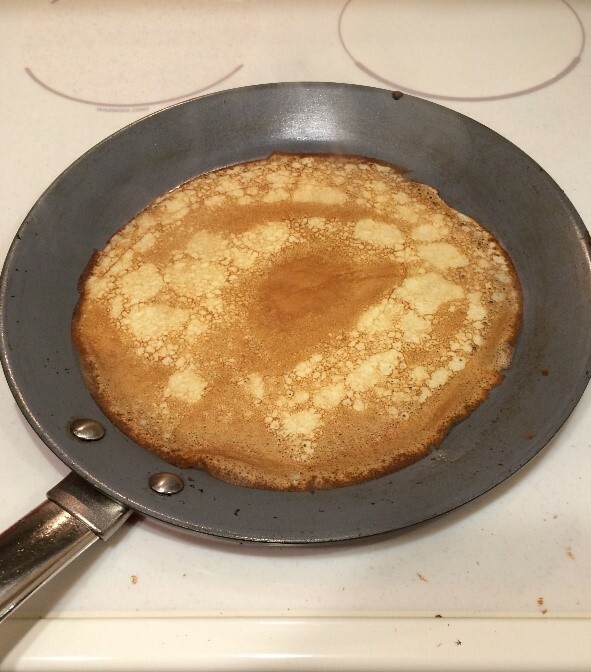 These pancakes remain an important part of Maslenitsa, Eastern Orthodoxy’s “Butter (or Crepe) Week,” celebrated now in the spring during Lent but observed in ancient times during mid-winter. Our German ancestors in Russia were known to stack them into layers spread with jam for a delicious treat, and the “4-3-2-1” recipe handed down to us remains a holiday staple. It calls for 4 eggs, 3 cups of milk, 2 cups of flour, and 1 tablespoon of sugar. We also add a dash of salt and fry them on a hot buttered skillet. Don’t worry if the first one or two are ruined as you gauge the proper temperature and master the flipping technique. After all, there is an old Russian saying that basically translates, “The first blina (pancake) is a disaster”! We now LOVE making family Suesspleena meals using our Palouse Heritage Sonoran Gold flour. Not only is it more authentic than the modern flour you'd buy in the grocery store today, but it delivers a naturally sweet, nutty-tasting flavor. Delicious!